Problems associated with surface and groundwater pollution by aluminium and iron is becoming a serious environmental challenge facing the limited sources of quality drinking water. Al and Fe sesquioxides predominates in most of the lateritic soils within the tropical region. Their degree of dissolution and mobility into the surface and groundwater system is determined by the chemistry of the prevailing aqueous environment. This work assessed the potential effect of environmental pollution on the chemical composition of rain and its resultant runoff, hence its contribution to the degree of dissolution of Al and Fe oxides. This was achieved by first determining the sources of pollutants which could possibly affect the physicochemical composition of runoff using remotely sensed information and field observations. Thereafter rain and runoff water samples were collected from theses pre-determined sources, and were analysed for their physicochemical compositions. Similarly, soil samples were also collected from the field and analysed for their mineral and chemical compositions. An empirical method was then employed to determine the degree of dissolution of Fe and Al oxides in aqueous solutions of varying hydrogen ion concentration which was prepared using the combinations of sulphuric acid, nitric acid, ammonium hydroxide, and deionised water. 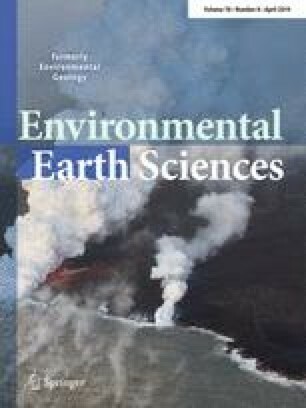 The results revealed that the degree of dissolution of Fe and Al oxides in lateritic soils increases with increasing acidity and/or alkalinity of the aqueous solutions. Increase in the acidity and/or alkalinity of the prevailing rain and runoff was attributed to their high level of ammonium, sulphate, and nitrate content which was introduced into the environment through anthropogenic activities. Authors are grateful to Mr. Asadu, and Mrs. Chiamaka of the Department of Geology, and Mr. Ofomata of Energy research centre of the University of Nigeria, for providing laboratory assistant. They are also grateful to Mr. Chidi Okeugo for providing assistant during the field work and to Miss Anulika Okpalanozie for proofreading and improving the English quality of this work. They also appreciate the effort of petroleum technology development fund and Mrs. Chineyenwa Azubuike for providing financial assistant.